You can listen to 'Stalker' here. One of Friska Viljor's previous album, 'Tour de hearts' (2008), I remember as being very serious, solemn of tone and performance. Too much so for my taste. Imagine my surprise listening to Remember our name and hearing an album that is clearly influenced by new folk(rock) movement, but special enough to stand out as the album contains enough pop influences to make a difference. 'Flageoletten' could even be a song from De Kift with just a little more horns and extra attention to the accents in the rhythm of the song. I'm even enthusiastic about the album. Friska Viljor is a Swedish duo. Daniel Johansson and Joakim Sveningsson who started the band in 2005. In 2006 they released their first album. Remember our name is the bands fifth album. The likeness to the Mumford and Sons of the world is more in spirit than in execution. The instrumentation on the whole is different, although a banjo and minimal drums e.g. can be heard. Friska Viljor leans a lot on keyboards to make up the sound and on large choruses. Head filling over the whole spread of the mix voices came to me. Opening song 'Did you ever' comes very close to Mumford c.s.. 'Stalker' has this same happy vibe, but filled in with electric guitars and an organ. With some definite 10s Britpop overtones. 'Bite your head off' proves that Friska Viljor can write a hit, just like Edward Sharpe, Of Monsters and Man, The Lumineers, etc. can. The song truly competes with 'Hey Ho' as far as I'm concerned. It just takes some airplay. "Bite your head off and throw it to the wolves" is an interesting line, isn't it? What could prevent the hit factor is the organ that almost sounds like a gimmick. Friska Viljor, which Google translates as "Healthy Wills", is far from a duo where the instrumentation of the album is concerned. Many and different instruments are used to fill out the songs. Most have a signature sound, leaning towards a gimmick. Like the flutelike keyboard sound in 'Stalker', the already mentioned organ in 'Bite your head off' or the 80s disco beat in 'Boom boom', which is very Nena or 'Major Tom'. 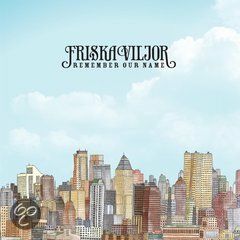 As gimmicks go, they can be irritating, but Friska Viljor gets away with it on Remember our name. By the end of Remember our name I have heard songs in very different flavours, but all with a great pop vibe. This Swedish band has tapped into a great pop vein, that made me perk up my ears and listen. Next to that there are plain good songs like 'Easy is hard' and the melancholy 'Streetlights' and the great, epic title song that finishes the album, in which the band goes all out. Remember our name is not among the best albums released so far in 2013. The competition is to fierce, as this blog attest to over the past weeks. However, Friska Veljor has released an album that is fun, great to listen to and sing along with. It provides a bit of sunshine on a cloudy day. That's worth something in this day and age.